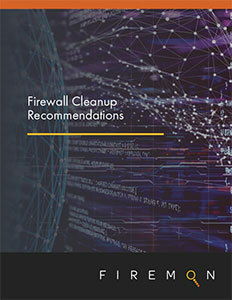 A guide to improved firewall efficiency through the elimination of unnecessary rules, overly permissive access, and excessive complexity. Firewalls are inherently designed to provide access control. Risk should be limited. Unfortunately, that’s not often what happens with firewall management. Instead, thousands of rule changes create overly complex rulebases and firewall misconfigurations. Some call this the “roach motel.” Rules check in -- but they don’t check out. When you add in exposures from 20-year old rulebases, your risks explode. By the end of the eBook, you’ll know exactly what steps to take -- and how to contextualize any spend to decision-makers based on the possible benefits. Once you’ve invested the time and energy to achieve the optimization of firewall policies, FireMon can help you keep it that way. FireMon provides a full suite of utilities designed specifically to aid in the cleanup, optimization and ongoing maintenance of a firewall rulebase.